Beaded stitch markers can make your knitting work in progress look prettier, as the beads dangle below the needle and settle against your yarn. In addition, they also distort your knitting less than plastic stitch markers, which can throw your gauge off, as they take up a lot of room on your needles. 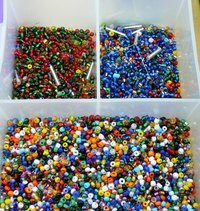 Beaded stitch markers are easily customized, using any combination of beads, colors and materials that you like. They are simple to make, and can be wonderful to use for your own knitting, or great gifts for other knitters in your life. Cut your beading wire to about 8 inches long. This will give you more than enough wire to work with on your first stitch marker. After the first one is complete, you may decide that you want more or less wire to work with. Bend the wire into a loop and cross the ends of the wire. Your loop should be about the size of your pinky finger. Twist the wire together three times just underneath the loop to keep it in place. String the beads onto the wires. Make sure that your last bead is smaller, to prevent the beads from sliding off the ends of the wire when you are finished. Do not string too many beads on, as it will make the stitch markers too heavy to be functional while knitting. Most beaded stitch markers dangle below the loop by no more than an inch. String a crimping tube onto one of the wire ends and push firmly against the last bead on the wire. Using your wire cutters, snip off the wire that is not strung through the crimping tube. String a few beads onto the remaining wire. Thread the wire into the other side of the crimping tube and back through the bead directly above the tube. Pinch the crimping tube closed with your needle-nose pliers. Discover the differences between knitting and crochet, including how to identify the stitches of each craft.